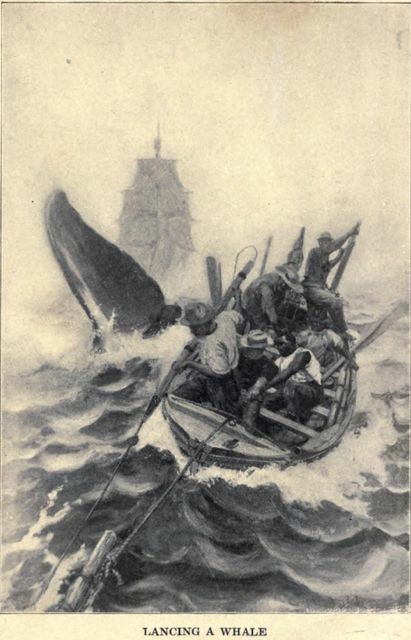 In old Norse times, the thrones of the sea-loving Danish kings were fabricated, saith tradition, of the tusks of the narwhale. How could one look at Ahab then, seated on that tripod of bones, without bethinking him of the royalty it symbolized? For a Khan of the plank, and a king of the sea and a great lord of Leviathans was Ahab. Some moments passed, during which the thick vapor came from his mouth in quick and constant puffs, which blew back again into his face. "How now," he soliloquized at last, withdrawing the tube, "this smoking no longer soothes. Oh, my pipe! hard must it go with me if thy charm be gone! Here have I been unconsciously toiling, not pleasuring- aye, and ignorantly smoking to windward all the while; to windward, and with such nervous whiffs, as if, like the dying whale, my final jets were the strongest and fullest of trouble. What business have I with this pipe? This thing that is meant for sereneness, to send up mild white vapors among mild white hairs, not among torn iron-grey locks like mine. I'll smoke no more-"